Transporter 4: Refueled is an enjoyable action movie with high-octane car chases, action stunts, and uhmm... hotness and sexiness, which will lead you to move to your seats every time these action sequences are occurring! The story is simple, but the action scenes are superb! I really love how the story unfolds, and how the story seems like a remake of "Charlie's Angels" but that's okay... because we came to see and enjoy the film! I think the former "Game of Thrones" star, Ed Skrein has given justice to the iconic Jason Statham role. And because of this, I am now waiting for "The Transporter 5"! Hahaha! *Meet the new "Transporter" and the new car! Let's not compare oranges with jackfruits... Ed Skrein might be new to this genre or in acting per se, but Ed Skrein is not Jason Statham... so why bother to look for Jason Statham's personality or the angst aura of Jason Statham into Ed Skrein? Ed Skrein is believable for the role, and I think, he's perfect for action films like this. Anyway, the selling point of this movie really are the car chases. The Audi car is so handsome in this film, even I for sure will buy it. Besides, the movie will not be called "The Transporter" if there is nothing to be used for transportation purposes. Maybe a bus, perhaps, but no! The black luxury car, Audi is really the star of this film! *Revenge-fueled women in "Transporter 4: Refueled"
Transporter 4: Refueled has just the right formula for a re-imagination (reboot) of the famous Jason Statham-starrer movie. If you are a fan of car chases and superb action sequences, don't forget to catch "The Transporter 4: Refueled" this week. 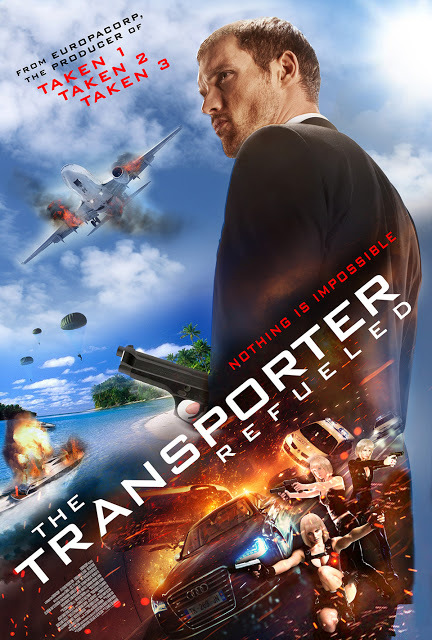 We will give "Transporter 4: Refueled" a 7 out of 10 stars because I still cannot get over with the action moves on "Hitman: Agent 47" so yeah, it's still high! Now showing in movie theaters, nationwide! Below is the official movie trailer for "Transporter 4: Refueled".